An early breakfast was followed by a short drive to the marina where we had time for a quick look at the low tide mud-flats. 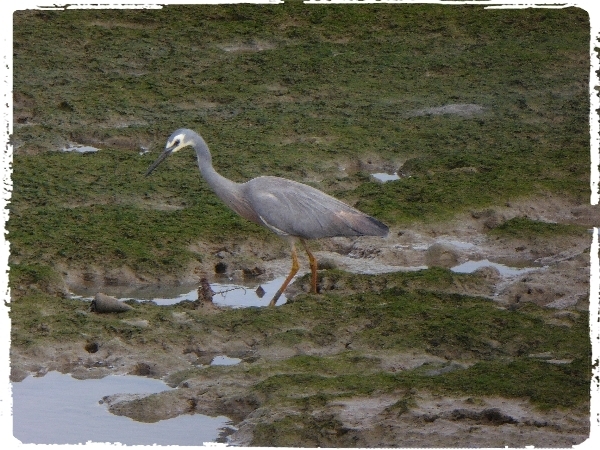 As usual the area was covered in birds, mostly waders but to our great delight we found White-faced Heron, Striated Heron, Great White Egret, Little Egret and Australian Pelican. 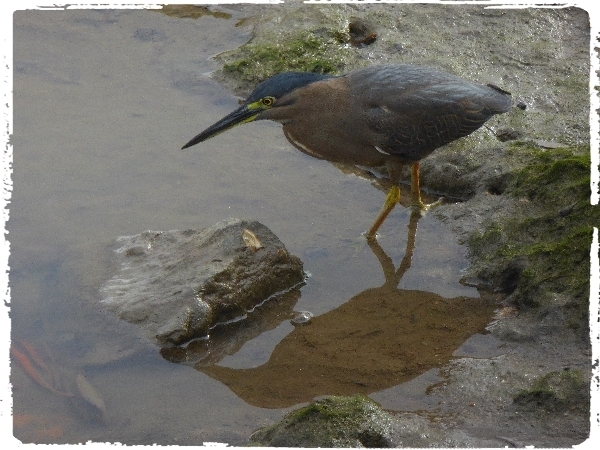 Two Little Terns flew along the shoreline and several species flitted about in the park behind the beach. At 8:30am we set off on the boat noting Crested Terns in the harbour and not much else, in fact, we didn’t see much for the first hour of the trip. 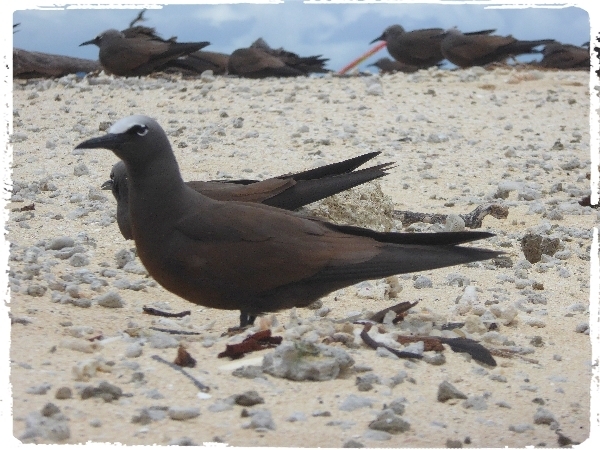 As we approached the Cay we started seeing Brown Booby’s, Common Noddys, Sooty Terns and both Crested and Lesser Crested Terns. 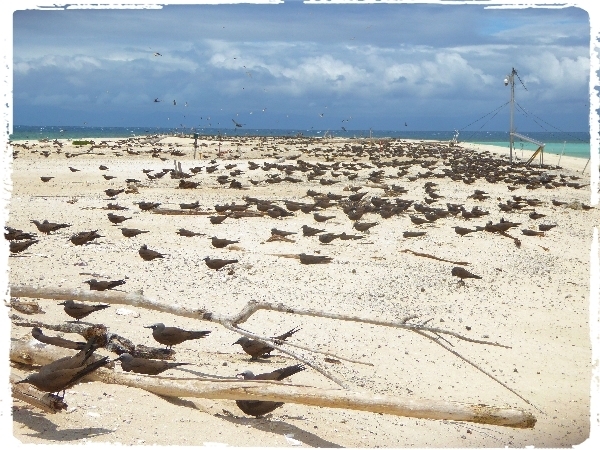 We arrived around 11:30am at the Cay which was covered in a mass of birds, the noise and the smell was quite noticeable as we were down wind, but the sky was alive with movement. 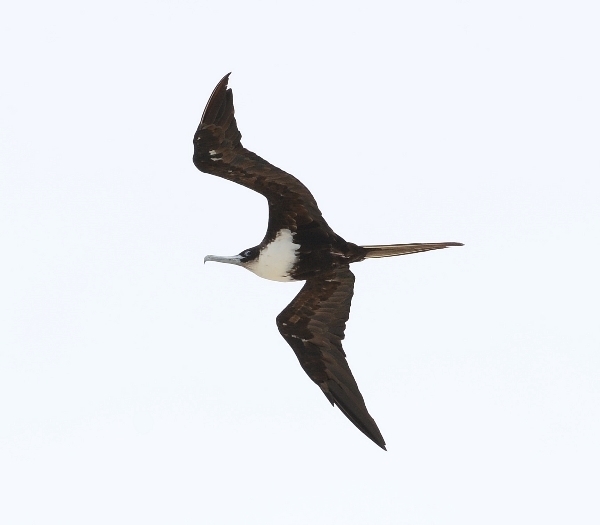 A Greater Frigatebird was circling over the tern colonies causing quite a stir as this huge predator is likely to take chicks. The Cay is just a raised bank of sand measuring about 800 meters long about 100 meters wide and just 3-5 meter high, very little vegetation grows on it. The birds nest in hollows amongst large dead-tree debris and allow a very close approach, human visitors are kept within a roped-off area. Over the next 5 hours we had a variety of activities to choose from, Scuba diving, Snorkeling, Glass Bottomed Boat cruises or just relaxing on the boat. A ferry service to the Cay run every 20 minutes we all opted for a visit to get a closer look at the birds. It was uncomfortable on the Cay as the strong wind whipped up the sand particles and sand-blasted us! 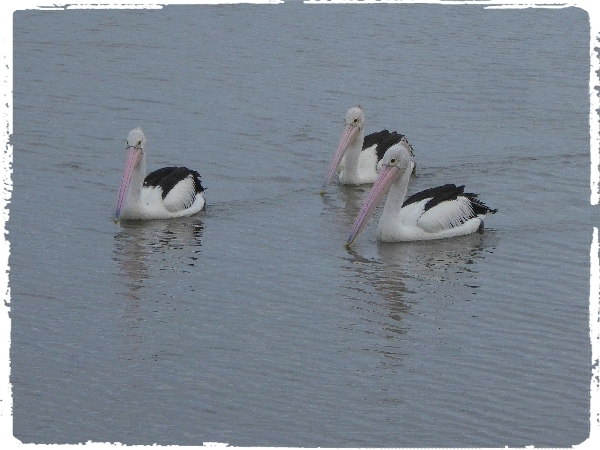 But the close proximity of the birds by exhilarating and provided good photographic opportunities. Most of the group went on a glass-bottomed boat trip and we all went on a ‘Round-the-Island’ tour to get closer to the birds on the other side. Some great sightings were made from this boat-trip around the island. Terns especially, we added Black-naped Tern, Common Tern, and had great views of Lesser and Crested Terns. We also saw Bar-tailed Godwit, Ruddy Turnstone and a Sacred Kingfisher tried to land on our boat! 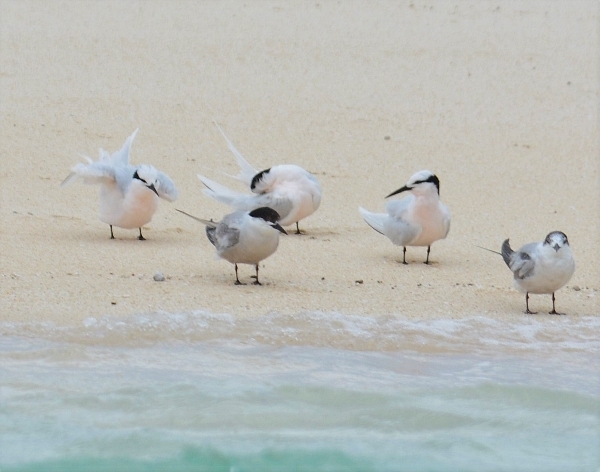 Back on the main boat we scanned the terns for new species and found Gull-billed Tern and a Bridled Tern which was perched on a buoy, smashing. Our return trip was very choppy at times, many people suffered sea-sickness including one or two of our group. It was getting dark when we docked so we drove straight back to the hotel. For dinner we walked to a restaurant on the Esplanade, many Flying Foxes (huge fruit-eating bats) were flying around and we saw several Bush Stone Curlews on our return walk around 9pm. A short bird log followed but everyone had enjoyed the trip, it was quality today not quantity!